Curtea de Arges, Poienari castle, Brasov’s old town, Bran castle, birthplace of Dracula: Sighisoara – medieval town, Bran Castle, Peles Castle, tomb of Dracula at Snagov monastery. 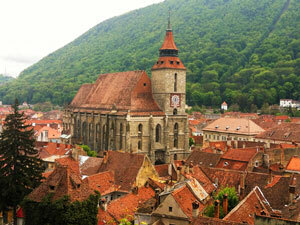 Find more about Prince Vlad the Impaler also known as Vlad Dracula on this short tour in Romania. The route will take you to visit the famous Bran Castle, the ruins of Poienari Castle – the true castle of Vlad, the birthplace of Vlad the Impaler - Sighisoara, Brasov - one of the most important cities from Transylvania, Peles Castle from Sinaia - former royal residence and it will end with a visit at Snagov Moanstery where is the tomb of Vlad the Impaler. Start the On the steps of Dracula tour from Bucharest in the morning. First stop will be at Curtea de Arges, the former second capital of Wallachia. The strongholds rebuilt in the 14th century. 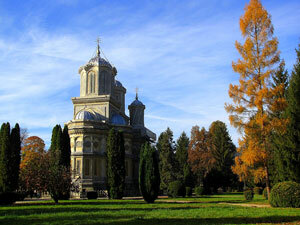 See its Princely Church and its frescoed interior which is one of the first examples of Romanian paintings. The Episcopal Church (the monastery) which is a recreation of the original built in 1512 -1517 by prince Neagoe Basarab (rebuilt in 1875 – 1885). Than we’ll continue our route until Poienari Castle (optional visit). Standing on a cliff but know in ruins this is known as the real castle of Vlad the Impaler. To get to the top you must climb up its 1400 steps (takes approx. 1 hour). 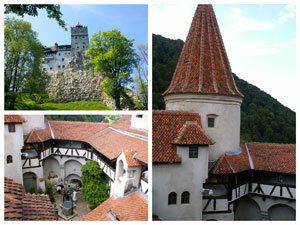 Continue to Bran and visit the famous Bran Castle, dating since 14th century. Also called Dracula`s Castle, it is situated not far from Brasov (25 kilometres) at the entrance in the Bran - Rucar passage. The castle got its fame from Dracula`s legend written in 1897 by Bram Stoker and later on made into a film by Francis Ford Coppola.. The first documents about the Bran Castle appeared in 1377. End the day in Brasov. Bella Musica Hotel***, located in the old town, or similar. Arrive at Sighisoara, Also called “The Pearl of Transylvania” the old medieval city is include on UNESCO's Word Heritage. The Old Town or the Citadel is the only one still inhabited in Europe - a lost world and still so at the present! Return to Brasov. Drop off at Bucharest International Airport (estimated time 2.30-3.00 PM) or at another location from Bucharest. 2 nights accomodation with breakfast; Private tour Guide – English language; Other languages on request; transport with car , minibus or bus; entrance tickets at the monuments; local taxes. Other services not specified on the intinerary; Lunches or dinners; Photo or video fees at monuments; Banking or e-payment fees. NOTE: At request we can customize this tour according to your wishes. Why to book On the steps of Dracula tour? If you are interested in Dracula’s story and legend we are inviting you to have a short tour in Romania following the history, life and legend of the famous Vlad Dracula. Our 3 days Dracula tour will start in Bucharest, the capital of Romania and will include the most important sights which have a connection with the life of Vlad the Impaler. Your tour guide will tell you what it is true and what is fiction in all this story. In the first day we’ll visit the ruins of Poienari castle, the true castle built by Vlad Dracula, the Curtea de Arges monastery and Princely court. Then we’ll cross the Carpathians mountains on the way to Brasov. 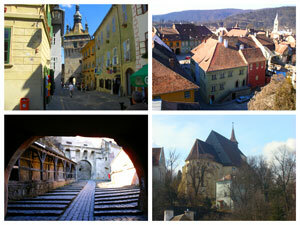 Next day we’ll have a tour to Dracula’s castle – Bran castle, than a walking tour of Sighisoara – the birthplace of Vlad. 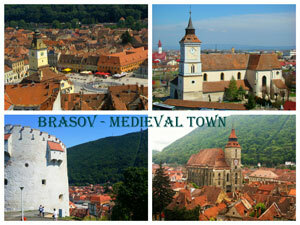 We’ll also visit the Old Town of Brasov, the town where Vlad use to live for couple years. In the last day of our Dracula tour will visit Peles castle, former royal residence and we’ll end the tour with Dracula’s tomb, located in the Snagov monastery, outside of Bucharest. Book our private guided Dracula tour for a quick introduction in the legend of this famous ruler. 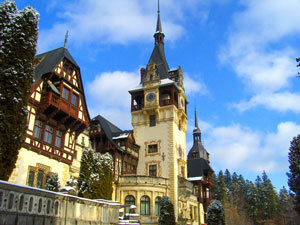 If you have more time you can choose our 5 days Dracula and Transylvania tour.